Arjun Rampal, apart from Om Shanti Om has been seen missing from the big screen for a long time. The handsome actor supposedly is taking time out, enjoying with hs wife, Mehr Jessia and daughters. 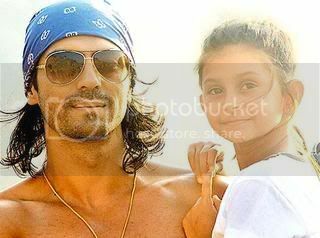 Here is an exclusive picture of Arjun Rampal with his daughter, Mahikaa. Surely the girl looks pretty, after all with such charming parents, what could you expect? Share Pic : Arjun Rampal With Daughter Mahikaa with your friends on Facebook.